If you’ve never made gougères, you really should give it a try. You can make them in advance, freeze them, and then bake them up for company – people will pop those little suckers like there’s no tomorrow. There’s something magical about the combination of warm baked goods and cheese, don’t you think? If you need some inspiration, in addition to the R2R blog, check out David Lebovitz’s post on gougères, wherein he provides some trouble-shooting tips. My advice: First, pick a really strong cheese. Instead of gruyere, I went with Ementaler (which is milder) because it was on sale, and because gruyere sometimes makes the roof of my mouth itch. The gougères were very tasty, but I think they would have been even better with a different cheese. Second, after you pipe the puffs, wet a finger and gently push down any “tails” so that they don’t burn in the oven. Finally, when the gougères come out of the oven, poke them with a bamboo skewer or a sharp knife to allow the steam to escape, which will help keep them crisp and puffed up. And be sure to have some friends over so that you don’t eat them all by yourself! Finally, the crostini were quick, easy, and tasted fantastic. I used a whole grain walnut cranberry batard, drizzled it with olive oil, and topped it with gorgonzola, pears, and walnuts. I left out the mascarpone, and it did not need it at all. This is an appetizer to have in your repertoire when you need to make something easy in a hurry. And I have an admission to make: I used canned pears, packed in their own juice, and it still tasted wonderful! And who doesn’t love bread and cheese? If you want more ideas on what to do with bread, be sure to check out Susan’s Yeastspotting roundup every Friday at Wild Yeast Blog! Gougères are on my list to make this year. Thanks for sharing! 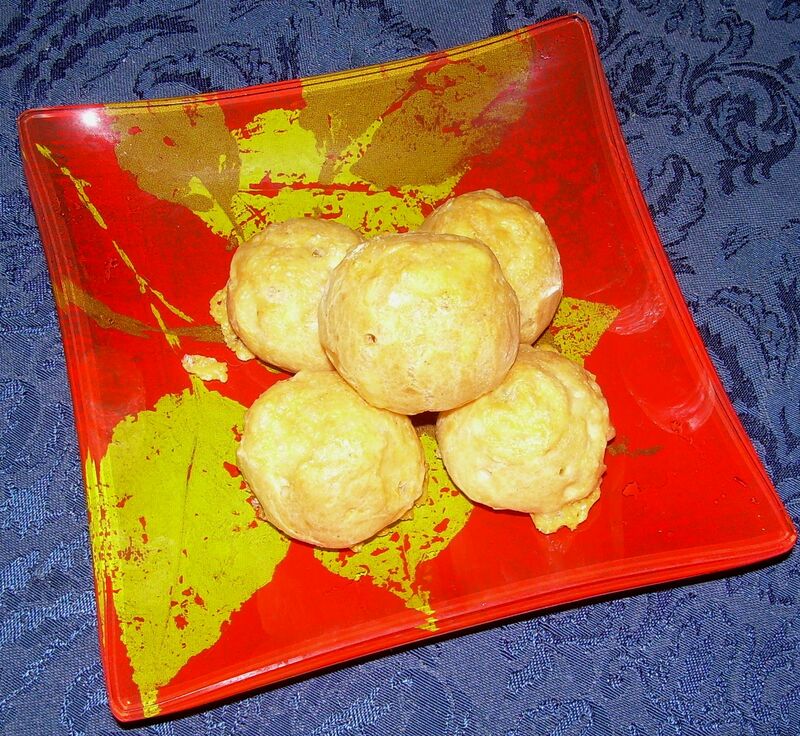 Great tips re the gougeres. I knew about the wet finger/pressing the tail down but didn’t know about the skewering for crispness. Makes the roof of your mouth itch? I wonder what does that? Maybe something they use in the cheese. Hmmm. I love gruyere but never heard of the cheese you mentioned. I will have to check it out. Beautiful looking gougeres! I love your presentation and photography. I was thinking the same thing about the cheese. i think I would have preferred it with a stronger cheese flavor. 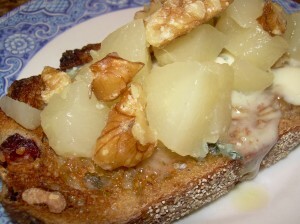 The crostini… Classic flavors and it’s probably even better with canned pears. Thanks for the gougere tips. Gougere are one of my daughter’s favorites and I’ll be making them soon. And the crostini combine my favorite flavors in a perfect bite!